At the beginning of every year, millions (maybe even billions) of people dream about the year’s possibilities. Many will decide that something must change, set New Year’s resolutions or goals and start after them with much enthusiasm but often without much of a plan. Without a plan and implementing strategies that help boost your chances of success, weeks and months can whiz by without your meaningful progress. And that’s a recipe for failure, which is why year after year, fewer than 92% of people actually achieve their goals. I want to help you be among the 8% of people who DO achieve (or even exceed) your goals this year! I’ve outlined the simple steps to get you there in this post. Plus, I help you organize you goals and dreams and track your progress toward successfully hitting them with the easy-but-powerful Your Best Year Yet Success Planner that you can grab now for free. Have you decided what you will create for yourself this year? If not, now is the time! Take time today to map out your goals. Then prioritize and schedule them into your calendar. What do you want to accomplish this year? What personal goals do you have? Maybe you want to take a true vacation (one without your laptop!) or spend more time with family and friends or achieve vibrant health. What about for your business? What financial goals do you have? Do you want to make a 6- or multi-6-figure income doing what you love? What about building a abundant “peace of mind” savings account so you don’t have to stress out over a financially bad month or two? Whatever you want to achieve this year, you need to list it out and schedule it in! Remember… if you don’t know where you’re going, you’ll end up where you’ve always been. Establish where you are now and the metrics around your current situation. It’s important to acknowledge where you are on your journey and find peace with it if you feel like you’ve fallen short of your dreams and goals. Spending a bunch of time resisting, being upset or rehashing past mistakes with “if only I had done things differently” self-punishment isn’t a good use of your time. This step is about taking an honest look at your starting point so you can plan your next moves the smart way and end up with different results - and ones you want! - very quickly. Be compassionate with yourself, but don’t stick your head in the sand, either, about the things that need to change. Celebrate your successes in order to build upon your wins and prime yourself for more. Oh, wow, are we ever good at noticing all the things we could’ve done better, while not giving more than a few seconds of attention to what went right.! Acknowledging your successes and then learning from them is an important part of planning for and creating more success. Make a list of what has gone right over the past 6 - 12 months, note where you make good decisions and identify what successes you can build upon (go for at least 50 things on your list!). Narrow your big list of goals down to the ones that really matter most to you. Start off by envisioning what you want to achieve this year – personal, health, business, spiritual and financial goals – and the feelings achieving each thing brings up for you. Does each one feel aligned for you? If you’re not sure, imagine yourself being in the state of having already achieved each one. Are you happy? How are you feeling? Was it worth the time and effort for the pay-off you got? Or does something feel off? Then take it a step further and get crystal clear on the big WHY behind each goal. Why is achieving that goal, milestone or dream important to you? What’s inspiring or driving you to even set that goal for yourself? This is key! A goal without a powerful, emotionally-driven and aligned purpose for its achievement most often fails to be achieved or you end up regretting altogether. Next, list out or mind map the high-level actions you need to take in order to achieve each goal. How much time will you need for each one? In what sequence must the goals and milestones be reached in order to build upon each other? You want to be sure you’re stretching the limits of what you think you can achieve but not so much that you end up being a prisoner of your own ambition working around the clock because you’re trying to cram more into a time period than is even remotely realistic. Schedule your goals, milestones and tasks. Pull up your copy of the Your Best Year Yet Success Planner (get your free copy here) and fill in the goals you’ve chosen and the milestones you need to hit to make each happen. What time period will you be working on Goal 1 and its milestones? You can use the Success Planner to plan out the number one daily activity - aka, the One Big Thing - you need to accomplish in order to move you forward. Then you can use the Success Planner’s calendar as a stand alone goals and task list to keep you on track, input the days’ One Big Thing into your calendar or get super organized with an online project management tool like Asana. Remember, you have to schedule in what’s important NOW before time slips away from you and you’re left wondering where the time went! Get into focused, aligned action to make daily progress toward your goals. Setting intentions and goals is a fantastic first step - and most people don’t even take - but it’s through right action and implementation on a daily basis that you’ll achieve your goals. How are you going to measure your success? For example, although I’m all for setting and hitting big money goals, the dollar figure doesn’t tell you the “how” of how you’re going to make the money. The “how” would be talking to potential clients, emailing out a certain number of proposals, and engaging in marketing activities that create revenue, for example. Those are the actions to focus on because you can measure and track them. And if you do enough of the right actions, then hitting or even surpassing your original goals is virtually inevitable. Track your progress to make necessary changes before you’re too far down a wrong path. Have you taken the actions necessary? Are you moving forward toward achieving your goals? What may have distracted you or taken you off track and what’s the plan of action to get back on track? Do your goals need to be revised given changing priorities or circumstances? What do the numbers say about your progress? Track your metrics, as well as how you’re feeling along the way, in order to nip problems in the bud and more quickly identify what’s working so you can do more of it. I’ll share with you some of my personal goals for this year. Perhaps they’ll spark an idea for you or motivate you to set your own. Help 200+ heart-centered entrepreneurs step into their own brilliance by creating, launching and filling their signature premium programs. Increase my level of charitable giving from 10% to 15%, help provide life-saving health interventions to the world’s poorest and empower women to escape the clutches of human trafficking and lead lives of dignity. Strengthen my spiritual well-being through meditation, supportive practices and mindful living. By creating a plan for success to guide my actions, I’m laying the foundation to make this year my best year yet and you can, too. Download your free Your Best Year Yet Success Planner to help you get started. What are your big dreams and goals for this year? What are you crazy excited to create in this year? What goals are you setting for yourself that gets your heart pumping with joy? And, most importantly, what aligned actions are you going to take to transform your goals into reality? Wishing you the most amazing year yet! Struggling with making sales online? Use this tool. Hi! I'm Christine Parma, a limitations-busting Online Business Strategist, Digital Marketer + Soul-Aligned Success Coach. I help heart-centered go-getters and spiritual entrepreneurs start and grow wildly successful, purpose-led businesses that give them the freedom and lifestyle they desire. By combining whip-smart business strategies together with powerful energetic and mindset transformation methods, I show you how to monetize your unique brilliance and quickly grow your impact and income without sacrificing what’s important to you. Learn more about the amazing results we can create together. Get access to exclusive training, personal feedback and coaching... for FREE! 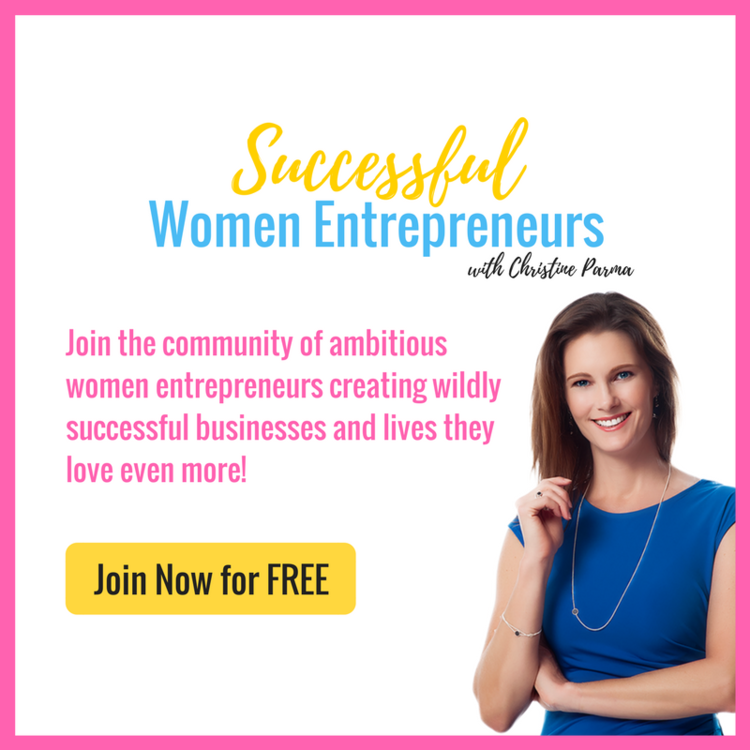 Join the Successful Women Entrepreneurs community to get access to exclusive training, coaching and support to help you build a wildly successful business you love and a life you love even more! Join the community now. Learn the uncomplicated Facebook marketing strategies I use to find and book new clients at over $4000 each... without spending a dime on ads! Click Here. I help Mama CEO's ditch the overwhelm and mom guilt so they can have a successful business and feel like an amazing mom, too. Step by step I show them how to grow their businesses in a way that allows them to do more of what matters most to them and have a life filled with joy, freedom and meaning. Want to Change Your Life? Then Change Your Friends.